What a revelation! Blogger Lim Sian See explains how we may have been conned to think otherwise. IT seems the Malaysian Home Ministry’s directive to suspend the publishing permit of The Edge Weekly and The Edge Financial Daily for three months from July 27 has caused a big reaction and hue and cry from the public, fellow media companies, politicians and, of course, all those self-proclaimed defenders of “Freedom of Speech/Press/Expression”, truth, justice and the American way. In my opinion, I think many may have fallen into a clever and pre-planned scheme by The Edge to project itself as a whistle-blower, as the victim and generally to garner lots of sympathy from less alert people. I suspect that The Edge actually wanted to get itself suspended. When you look at the timeline, you will understand why. June 22, 2015: Ex-PetroSaudi executive Xavier Justo is arrested in Thailand on suspicions of blackmailing, possession and selling stolen data. At this point in time, all the fingers pointed to Sarawak Report and Clare Rewcastle-Brown made a big hue and cry about protecting Xavier Justo and even wrote an open letter slamming the Switzerland government for not protecting its citizen. At this point in time, no one suspected The Edge of colluding with Clare and being a part of the dealings with Xavier Justo. The Edge also kept silent about the arrest of Justo and passed no commentary on it. June 24, 2015: Home Minister Datuk Seri Ahmad Zahid Hamidi says they will investigate The Edge for publishing what it deems to be unverified news. 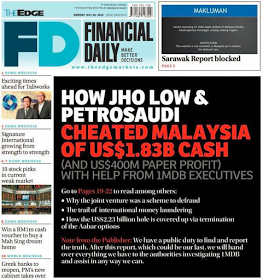 June 27, 2015: The Edge said that it will no longer refer to the emails it had published on dealings between 1Malaysia Development Berhad (1MDB) and PetroSaudi International (PSI) amid doubt over the authenticity of the documents after a former top PSI executive was arrested. July 1, 2015: Home Ministry issues show-cause letter to The Edge over using unverified PetroSaudi news in their 1MDB coverage stating why they should not be suspended. The Home Minister said after receiving a report on the arrest from their Thai counterparts that included forensic analysis of the leaked data, that the Malaysian authorities concluded the documents had been tampered with in a bid to tarnish the joint venture. “We found from the forensic aspect that the leaked data downloaded by the former executive with malicious intent… to distort facts about the transaction between 1MDB and PetroSaudi and the leaked data was published in Sarawak Report and The Edge. During this period of time, The Edge, whether in its weekly or its daily, kept their word and no longer published articles on 1MDB based on information from the allegedly stolen and tampered PetroSaudi documents. July 1, 2015: Home Ministry issues show-cause letter to The Edge over using unverified PetroSaudi news in their 1MDB coverage, stating why they should not be suspended . Again, during this period of time, The Edge, continued its silence on the 1MDB and PetroSaudi dealings. July 17, 2015: Shock! Horror! Thai police suddenly held a press conference in Thailand on the Justo arrests. Both the the Bangkok Times and Singapore’s Straits Times reported reported that Justo had met key Opposition leaders, Sarawak Report and a Malaysian media mogul in Singapore and these people were part of the group that dealt with Xavier Justo. At the same press conference, the Thai police also confirmed that the data was tampered in small but important ways in a bid to undermine the government and overthrow the government. And worst, Thai police say it has all the proof given by Justo on who and how these people were involved..
For the first time, Thai police essentially hinted that The Edge had become a key suspect. “Asked whether the tampering was extensive, Thai police spokesperson major-general Prawut Tavornsiri told Malaysiakini: “The changes are small, but important”. He said Thai police had made this deduction after interviewing Justo, who insisted to them that only the original documents from PSI were passed on to others. 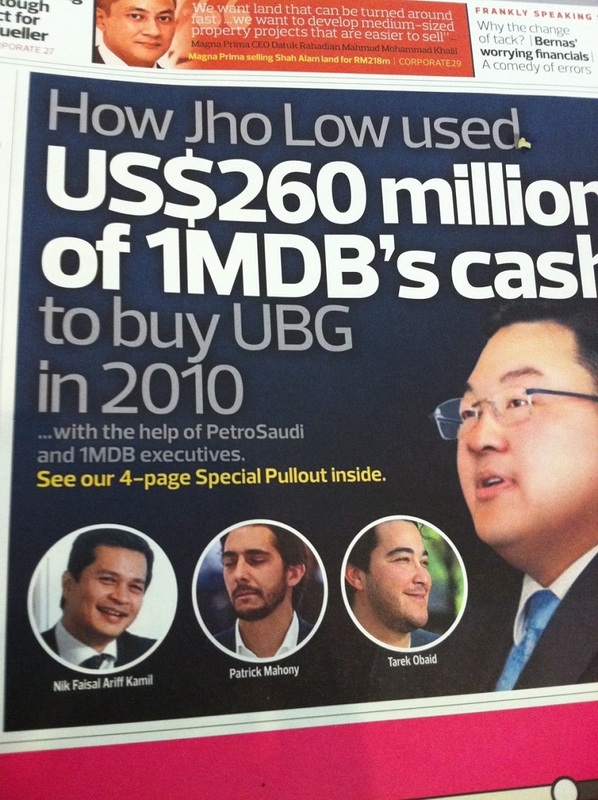 July 20, 2015: A mere 3 days later after Thai police had exposed their name, despite keeping quiet for almost a month and saying they will no longer use the documents and email, The Edge went for broke and came out with the article “How Jho Low & PetroSaudi schemed to steal money from the people of Malaysia via 1MDB”. Front page stuff too. Quite impossible not to have noticed it. The Word “Cheated” was used despite all the two Big 4 independent audit companies in their certified audits spanning many years and the interim Auditor-General report stating no evidence of money being lost. Even the Parliamentary Accounts Committee (PAC) would not even dare to announce this conclusion of money “cheated”. And yet The Edge did use that “cheated” word. Actually, The Edge needn’t have bothered publishing this article as it was merely a summary and there was nothing new that was not already published in the many articles that The Edge published in the many months before. Note: Much of the summary article that The Edge is factually incorrect which 1MDB had pointed out in their press statements multiple times. Thailand and Abu Dhabi govt are possible “cronys”, plots to blacken face and auditors should NOT be trusted. The “Final Kopek” of Tong and The Edge? And this was despite having received a show-cause letter from the Home Ministry and the The Edge’s own commitment not to use those documents any more. Now, if you were the Home Minister and having issued a show-cause letter and The Edge having publicly stated that they will refrain from using the stolen and possibly tampered letters, what would you do? Should the Home Ministry just twiddle their thumbs and pretend nothing happened or just issue a “please don’t do it again” letter?Of course the Home Minister was left with NO CHOICE but to suspend the Edge. In fact, KDN should have been bolder and not just suspend their printed dailies and weekly and gone all the way and requested the Malaysian Communications and Multimedia Commission (MCMC) to suspend and block all their digital versions, including Malaysian Insider.I mean, if you want to suspend, you don’t take half-measures.Singapore did this just a few months back by completely disabling their opposition portal “The Real Singapore” even though the charges had not even gone to court yet.If Singapore can do it, why can’t we?Breaking their own promise to refrain, ignoring the show-cause letter, publishing that article and having such a controversial cover page, it’s as if The Edge is forcing the hands of the Home Minister to suspend them. To not suspend them means any future directive from the Home Ministry can simply be ignored. It wasn’t until the exclusive interview with Xavier Justo by Singapore’s Straits Times was published two days ago onJuly 24, 2015 that we found out the reasons why The Edge acted this way and practically begged to get suspended. Justo says he has all the proof and has passed all to Thai police and that the Singapore Straits Times have read the full 22-page confession by Justo. Xavier said The Edge had mentioned they had planned to modify the documents and bring down the Malaysian government. Treason and conspiracy working with foreign interests. “I gave the original documents without any kind of alteration,” he claimed. “I can say that I gave those documents to two groups of people,” he added. One was Ms Rewcastle-Brown and “her IT guy” and the other was the Malaysian businessman and his colleague. He alleged that those he met had talked about using the documents “to try to bring down the Malaysian government”, adding that they also referred to plans to “modify the documents”. Vary serious charges of treason, falsifying documents, possession of stolen data and money laundering. Conviction of any of the above crimes in any of the various affected jurisdictions would mean lengthy jail sentences and all the proof is there and a signed confession from a key witness, too. The Edge KNEWthat they could not escape so easily and that they were essentially screwed. Hence, the best thing they could do now is to get themselves suspended and pretend that they are the victims (even though they are the conspirators), pretend that they are whistle-blowers (even if documents were tampered with) and get public sympathy from all parties. The Edge is probably banking on a trial by media and incite public sentiments to try to prove themselves as innocent when they know that due to overwhelming evidence, their chances of escaping any charges are slim to none now.Truth to be told, trying to act like a hero and trying to draw sympathy is pretty much all that The Edge can do right now.It’s got nothing to do with them being brave, if not, they would not have publicly agreed to stop publishing those emails then and actually refrained for one month.It’s because they were publicly identified and named by Thai police and Justo that they knew their end was near and hence they had to make this final step to get themselves banned and at least win some public support.The Edge would, of course, say they did no wrong but then again, many millions of criminals before their trial and even after they are in prison still claim they did no wrong. Yes, many of us have been used by The Edge. In the process, many people got used. But then again, this is Malaysia and us Malaysians are easily used all the time — like when we were used by stories of 40,000 Bangladeshi (voters) and blackouts that never happened even though so many of us were absolutely convinced all these happened — but yet, it didn’t happen as we all soon found out. Note:, If you are thinking that the bunch of bankrupts accusing Sarawak Report of forging documents are not credible,. please read this one and you will realize how easily your attention is diverted and how easily your perceptions are being manipulated.